CKEditor 3.0 Release Candidate is available to public! Release was announced on June 22, 2009 on FCKeditor site. This release is not yet targeted to production web sites but it can be used for evaluation purposes. SCAYT is already available in CKEditor release candidate version! Please note, that SCAYT support in RC is realized for FireFox, Chrome and Safari browsers. Internet Explorer is supported, but SCAYT was disabled in RC for IE because of some issues, which have already been fixed. Support of Internet Explorer will be available in the release version of CKEditor. Demo and downloadable package is available on the CKEditor web site. 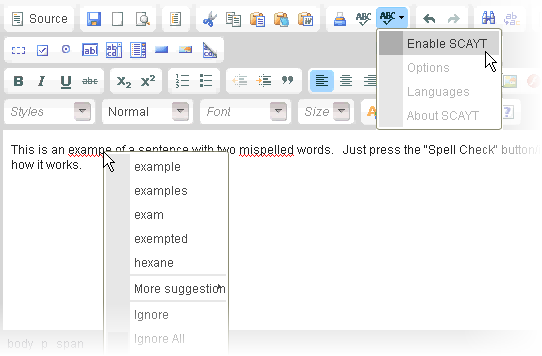 The final release of CKEditor 3.0 with WSC and SCAYT 2.0 as an embedded spell-checkers is scheduled to July 7, 2009!